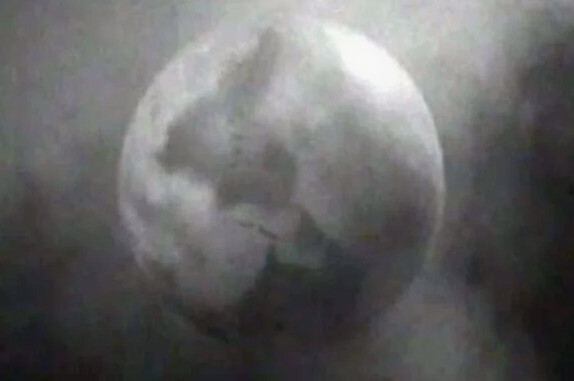 Back in the 1960s, Doctor Who introduced the Cybermen as coming from a “counter-Earth” called Mondas, a twin planet of our own that had escaped detection as it orbited the sun exactly opposite the Earth. Mondas was flung into deep space when the arrival of Earth’s moon disrupted the balance between the planets, and the inhabitants gradually surgically altered themselves to survive the increasingly harsh environment, until they were cold, cybernetic monstrosities who strapped enormous engines to their world, intent on returning to their home star and draining Earth of its precious energy reserves. Mondas itself was depicted as being exactly identical to Earth (except upside-down1While upside-down, it is still rotating in the conventional way, suggesting that the Mondasians also consider “north” to be “up” on their maps. I’m not sure whether that means that, spatially, the planet was upside down relative to Earth and rotating in the same direction, or the surface was aligned the same way but was rotating backwards, like Venus . I doubt anyone gave it that much thought. ), complete with humans identical to those on Earth. There is no prize for finding the most scientific inaccuracies in that paragraph. “World Enough and Time” and “The Doctor Falls,” the two-part season 10 finale of Doctor Who, revisited the Cybermen’s origin. While set on a ship either constructed by or commissioned for the people of Mondas rather than the planet itself, we do see a computer screen showing a display of the planet. At a casual glance, Mondas still appears to be identical to Earth (though right-side up this time2And still rotating in the conventional direction. Maybe they reversed the planet’s rotation when they attached the engines, like that episode of Futurama. ), but the Doctor Who art department took the time to subtly modify the layout of the continents as a freeze-frame bonus. I’d hoped that the BBC’s Production Art gallery for the episode might contain a complete map, but, alas, it is not to be, and it seems unlikely the show will be revisiting Mondas anytime soon, leaving reverse-engineering the planet to fans like me. 1. ↑ While upside-down, it is still rotating in the conventional way, suggesting that the Mondasians also consider “north” to be “up” on their maps. I’m not sure whether that means that, spatially, the planet was upside down relative to Earth and rotating in the same direction, or the surface was aligned the same way but was rotating backwards, like Venus . I doubt anyone gave it that much thought. 2. ↑ And still rotating in the conventional direction. Maybe they reversed the planet’s rotation when they attached the engines, like that episode of Futurama.